The 2019 Honda Pilot, on the outside, looks like any other modern SUV. It has the ride height and space that’s convinced Americans to abandon cars and flock toward larger vehicles, and, like the rest of that segment, it blends in on the road. But the inside is where the Pilot’s top trim really shines. The Elite trim, which this car was, is the top of the Pilot range. It comes with a high-end price at nearly $50,000, and, while it looks normal on the outside, it’s a high-end SUV to match once the doors open up. It’s no Mercedes or BMW, but it sure isn’t your everyday vehicle, either—no matter how much it may look like one. The Pilot isn’t a vehicle you’ll make excuses to drive, but that’s not the point. The point is to make the drives go smoothly when the whole family needs to pack up and get somewhere. And, if you check this many options as this Pilot did, you’ll be surprised how cushy it all is. The new Pilot is a refresh, meaning it got styling and technology changes for 2019 but not a full overhaul. It comes in both all- and front-wheel drive, with the MSRPs ranging from the $32,445 FWD Pilot LX with a six-speed automatic to the $49,015 AWD, nine-speed Pilot Elite. This one is the latter. The range is key: In a market where crossovers and SUVs are what people want, having options on a model is important to reach every price point. That range also makes it easy to forget how fancy certain models from non-luxury brands can get, like this one. Seven people can fit into the Pilot, and, naturally, it’s all about family features and technology. The Elite trim is on the more specialized end of the crossover and SUV boom in America, since the price is high and a potential buyer needs a good justification for purchasing seven seats. But, like things should be with a $50,000 price tag, the expensive vibe it gives off doesn’t fade quickly. 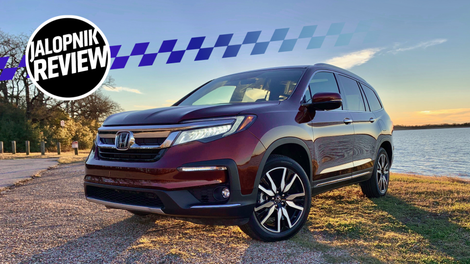 Honda rates every 2019 Pilot trim at 280 horsepower at 6,000 rpm and 262 lb-ft of torque 4,700 rpm, and all of them take regular gas—something that’s nice now, but may not matter much in the future with the automaker-led push for higher-octane fuel. The power, which isn’t astounding for an SUV, comes from a 3.5-liter V6 and through a nine-speed automatic on the Elite. The AWD Elite trim comes with 20-inch wheels, and has a towing capacity rated at 5,000 pounds, while FWD Pilots are rated at 3,500 pounds. Every trim but the Elite seats eight, and the car got about 17.6 mpg in the city while with me. The IIHS also gave the Pilot good enough safety ratings to make it one of the 57 models that got awards for 2019. The Pilot got the IIHS’ top rating of “Good” in most of the main categories, and had top-rated headlights on certain trims. Full ratings are here. One of the most immediately evident things the Pilot is how much headroom it has, and the atrium vibe given off by its massive front windshield. The whole SUV feels like a giant, fancy, leather-laden bus. The Pilot’s leather quality feels expensive, as it should at $50,000, and everyone in the first two rows has a captain’s seat with armrests. The driver gets a huge, cushy steering wheel and smooth pedals, but the Pilot is not at all quick. It just does its job, with an average amount of power. It can, however, take obstacles easily—the suspension is “mow over speed bumps and not even feel it” good. There’s also a wireless phone charger under the infotainment screen, which is handy but takes ages to power the famously slow-charging iPhone XS. The Pilot, though, is all about features to make it easier for the group to ride along. It’s more about technology and usability than actual driving, but its apps, driver-assistance tech and features feel manageable rather than overwhelming—something that can’t be said about a lot of modern cars. To keep an eye on the kids, front passengers can press once on the sunglass holder to pop down a mirror and twice to bring the holder down. There’s a “Cabin Talk” app for when it’s too loud to get everyone’s attention, which cancels out audio and sends passengers’ voices over a microphone. Along with a backup camera, which the U.S. made mandatory last year, there’s a top-down angle for connecting a trailer. 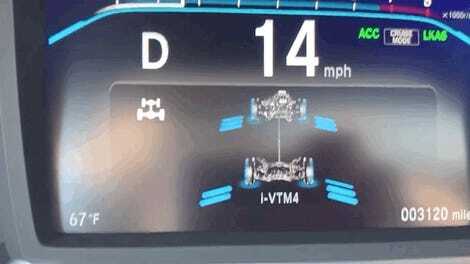 There’s also plenty of driver-assistance tech like lane-departure assist, which is typical in higher trims of new cars. 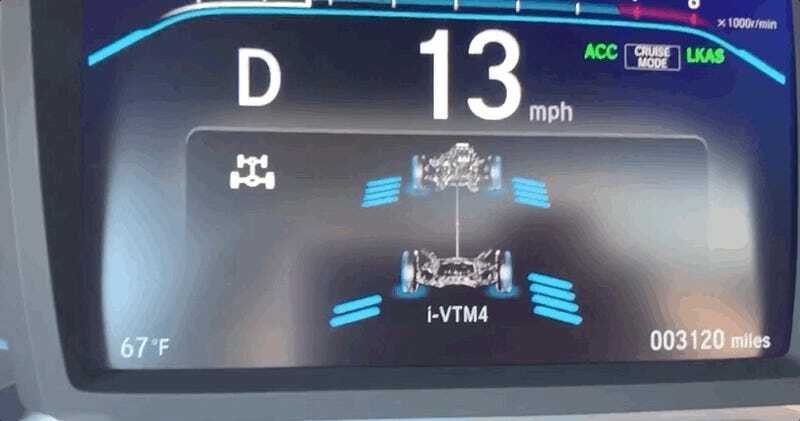 One of the coolest features, for someone who likes cars but has people to haul, is the option to watch its torque-management system in real time where the gauges typically sit. The Pilot’s AWD system varies distribution torque to the wheels, meaning torque can go to all of the wheels or just a few, in different amounts, depending on which ones need it. For those in the back, the Pilot lets passengers can control music and navigation with permission, and there’s a dropdown screen between the two seats in the center row. The screen has apps, headphones and a Blu-ray player, and the front infotainment screen has an app to control it if parents want a say in what’s going on. If not, there’s a remote in the backseat. Another convenient thing that’s easy to overlook in the Elite trim is how the centerpiece between the seats in the middle row can bear weight. It works well even with the weight of an adult, and lets people avoid the annoying routine of pulling a seat forward and tossing it back to reach the third row. There’s a lot of glass in the Pilot, from the windows to the giant sunroof space, making it feel even bigger than it already is. You’d think the Pilot was bigger, too, if you counted cupholders—there are 10 total, with four up front, four for the two seats in the middle, and two in the back. That’ll either keep a person really hydrated or really caffeinated, depending on their beverage preferences. Perhaps the most annoying thing in the Pilot, particularly while driving, is how packed the infotainment screen is. It’s hopeless to work correctly while moving, and isn’t much easier at a stop. Changing a radio station while trying to watch the road is nearly impossible, because the tune and preset buttons are so close together. That might not be a problem if you mainly choose from presets, but, think: Your channel favorites while alone might be far different than the ones you scroll through with the kids in the backseat. The screen itself is made of shiny, glass-like material that looks beautiful when clean, but gets fingerprint ridden as soon as it’s touched. The screen won’t show texts while moving, but it’ll read them—and then some, with certain phones. When synced to an Android, it read the message plus a lot of random numbers and timestamps, sounding more like a doomsday clock than a text. Audio in the Pilot varies by row. On factory settings for the three adjustments—treble, midrange and base—music up front is clear and feels encompassing no matter the volume. Moving back, the quality isn’t as universal. With the volume just past halfway, music sounds hollow in the middle row, and is the opposite in the back. There, the base is reverberating-in-your-teeth heavy. The Pilot lacks a traditional shifter, instead having the PRND buttons common of certain Hondas and Acuras. The selected button is outlined with a glow, but the letters don’t light up at night, so finding one means a driver either has to feel the buttons down, bend toward them and squint to read them, or burn it into muscle memory over time. The adjustment for the steering wheel is also manual, which is surprising at $50,000, but not necessarily bad—it’s one less motorized thing that can break. Driving is smooth in the Pilot, but if you want to have a little fun, there isn’t much of a feel difference between sport mode and regular driving mode. From a driving perspective, the sport mode just hits the basics: It has faster shifts, revs a little higher before shifting, and sounds like it’s revving even when you’re barely pressing the gas. The problem is, you have to really pay attention to notice any of it. At $50,000, the Pilot Elite trim is annual-salary expensive for a lot of Americans, but also seems relatively normal in this market. Crossovers and SUVs are booming, and a lot of them offer a wide trim range to cover more potential buyers, like the nearly $20,000 gap between the cheapest and most expensive Pilot. It can also be difficult to find a new car one would consider bad, let alone one that isn’t sopping with technology and safety features. All of that costs money, but $50,000 isn’t the only number here—a lot of people these days are more in the habit of considering the monthly payment, be that a lease or a loan, instead of the actual MSRP. If that payment works, the Pilot likely does, too. Plus, as fancy as this loaded press-tester Pilot was—and they often are—it’s hard to tell how many buyers will really spec the SUV out this much. Probably not many. The one thing to remember with this SUV, and any new vehicle stuffed with technology, is that it’s not all about car payments. General maintenance costs are often proportional to a vehicle’s MSRP anyway, and crumpling up all of that fancy safety tech can make crash repair bills nightmarishly high. It’s something to consider before signing off on any new car. The 2019 Pilot Elite trim is expensive, and inconspicuous on the outside due to a sea of modern SUVs and its lack of a flashy badge. But, on the inside, it feels just as fancy as any other vehicle you might consider spending this much on. It’s a good SUV, if you need space and have the money. It’s not life changing in terms of driving, but it’s comfortable, well laid out and floats over speed bumps like it’s spending a day on a lazy river. Some elements of user interaction could be better, but they’re overshadowed by all of the things the Pilot gets right. And, as with everything in life, that’s all you can ask. A huge, family oriented SUV with the apps, features and comfort to match, even if the price seems high.